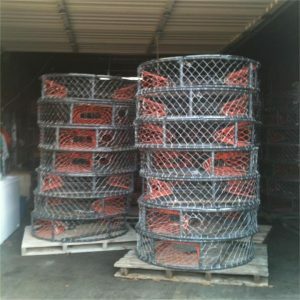 Net cages are built as a system of ropes and netting that can be constructed in various shapes, sizes and materials. The net cages are designed to transfer and carry all major forces through the ropes. 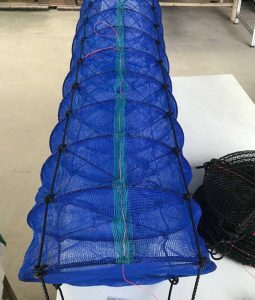 The net cage is also supported by the mooring system that keeps the farm in a fixed position and to avoid transfer of excessive forces to the net cage. It is important to take account for the loads from current, waves, weights and handling of the net when dimensioning the net cage. “In the past, materials such as cotton and flax were used for the net bags. These materials become heavy in water and their strength is rapidly reduced; in addition, they are not very durable. Nowadays, synthetic plastic materials such as polyamide (PA, nylon) predominate. This material is cheap, strong and not too stiff to work with.”. The last decade, other materials like PET-wire (Polyethylene terephthalate) have been taken into use. PET-wire nets are semi-rigid, and requires less weights to keep the nets in place. The benefits of PET-wire are that it offers more protection against storm damage and predators like seals. Stronger materials also enable the net to better maintain its shape and may have a longer life span. This results in reduced deformation and drag, so the risk of rifts and other damage from adjacent equipment is reduced. PET-wire nets also have a reduced overall weight displacement for the cage system, which means less load on the mooring system and a reserve buoyancy for the cages. The tensile strength of the EcoNet PET-wire is superior to Nylon and retains a high tensile strength for decades both below and above water. However, the traditional Nylon is a cheaper material, even though PET-wire may have a longer lifetime. PET-wire also weights more, which can complicate the handling of large nets. Handling, together with other human errors and structural errors, are highlighted as some of the main challenges when it comes to fish escaping. (7) simple and convenient construction. The materials properties for the SK one component polyurea has not been tested for use in aquaculture net cages.